PhD Works is a program that supports the career exploration and professional development of SBU’s graduate students. The program aims to assist SBU graduate students prepare for careers beyond traditional academic research. PhD Works is new award that expands ScienceWorks and our previous awards for diversity and inclusion. 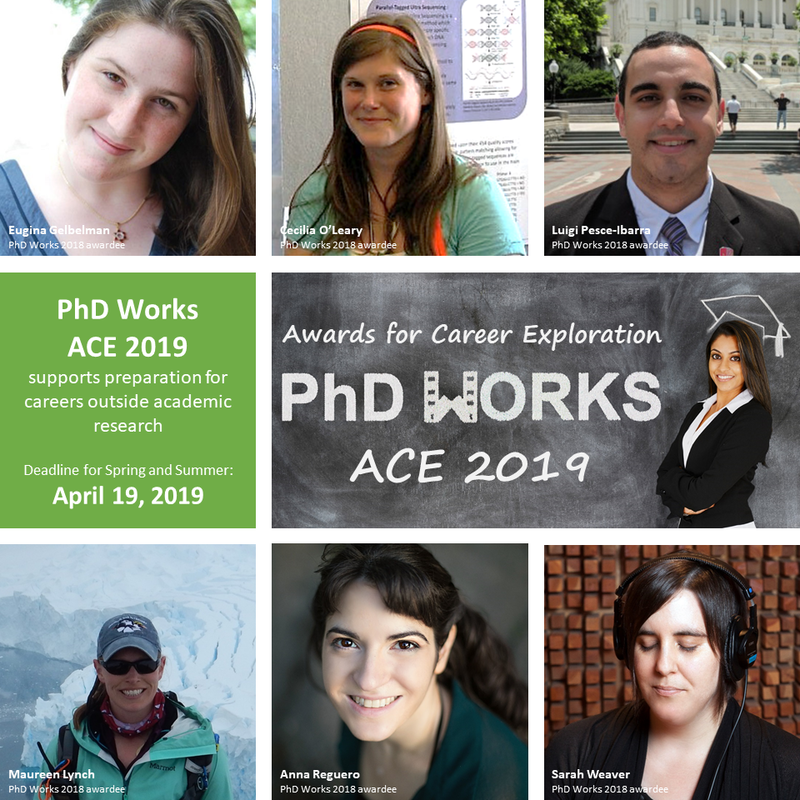 PhD Works Awards for Career Exploration (ACE) 2019 offers up to $750 to support meaningful career development activities focused on preparation for the professional workforce outside the standard academic research track. Both PhD and Master’s students are strongly encouraged to apply for PhD Works ACE 2019 if they have engaged in career and professional development activities held between January 1, 2019 and August 23, 2019 for which they have unreimbursed expenses. Any Stony Brook graduate student enrolled in any SBU Master’s or PhD program during Spring 2019 is eligible to apply for PhD Works ACE 2019, regardless of their citizenship. Activities that advance the student’s career and professional development goals are eligible for PhD Works ACE 2019 as long as they do not include traditional academic research or the traditional requirements of an academic graduate program . These activities must be held between January 1, 2019 and August 23, 2019. Activities related to students’ thesis, dissertations, academic research, lab work or similar, including, but not limited to, fieldwork, lab meetings, conference registrations, conference travel expenses, etc. Salaries, stipends, or income to compensate the applicant or any other person. Expenses related to a course, event, internship, project or activity that is part of an applicant's degree program. Purchase of equipment, software, consumable, or non-consumable supplies. Registration or travel to consulting case competitions. Unreimbursed travel to internship sites. Registration or travel to professional development workshops, seminars or classes. Industry or business event registration. One-time subscription to career development program or site. Please, keep in mind that there are additional restrictions on reimbursable expenses for international students (we can only reimburse travel and registration costs). Contact Dr. Paola Cepeda, the PhD Works ACE 2019 coordinator, to find out if your expenses would be eligible. Are you or your activities not eligible? Not sure how to kickstart your career exploration? Learn about the PhD Career Ladder Program! Applicant’s information and demographics as requested in the PhD Works ACE 2019 form. A 2-page PDF document containing the applicant’s current CV/resume. A single PDF document containing the applicant’s proposed budget for the PhD Works ACE 2019. The requested funds must not exceed $750. This document must also include documentation (e.g. receipts, quotes, etc.) for any completed expenses (if the activity has already occurred) or estimated expenses (if the activity is yet to be held). Important: Activities that directly support your dissertation, such as academic conferences or travel for research, are not eligible for this award. You will NOT be able to save your progress in the application. Therefore, please prepare all of your answers and uploadable files in advance. You can review this sample blank application before accessing the PhD Works ACE 2019 portal. Applicants can request up to $750. However, depending on the size of the eligible pool, awardees may receive less than the amount requested. A report on how the awardee benefited from PhD Works ACE 2019 and what was learned or accomplished. Original receipts for the expenses incurred. Contact Dr. Paola Cepeda, the PhD Works ACE 2019 coordinator.